A Published Event is a remarkable project for nurturing and housing original stories. Their narrative greenhouses have stimulated the growth of a unique creative scene in Tasmania. In this quarterly essay, we learn how important it is that stories take material form in order to become part of our world. Stories can reside not only in paper books. They can also reside in stone and wood. We are A Published Event. 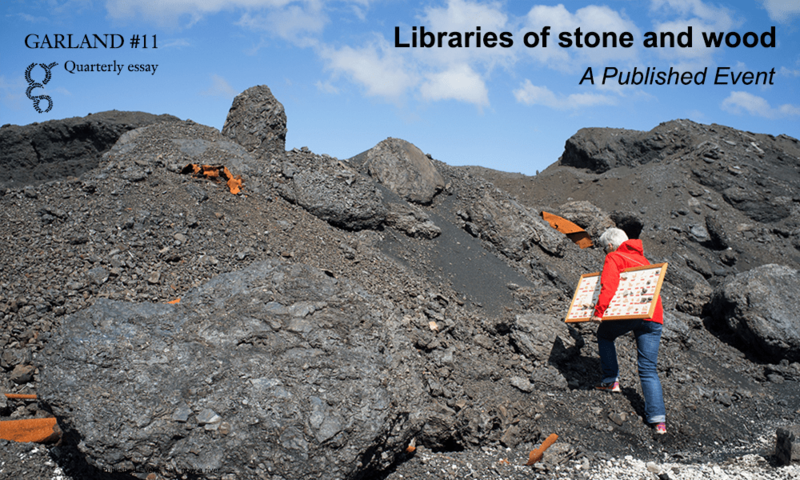 Our tools are our stones are our books are our publics. We were always more than human. Always and already permeated by other lives, other histories, other beings. If a human can be reimagined as an ‘organism that persons’, then A Published Event is the organism that persons us. As collaborative artist, A Published Event (Justy Phillips and Margaret Woodward) makes long-term relational artworks through shared acts of public telling. Exploring chance encounter, constructed situations and the shared authorship of lived experience. We work with artists and writers, materials and ideas, to create fictiōnal writing, prose, book-works, video, installation and performance. Our use here of the prefix fictiō meaning “to make with”, differs from contemporary understandings of fiction, as “to make up”. Embracing fictiō, the Latin root of fiction, enables us to make-with and from lived experience, a process we call fictiōneering. Our hybrid works—a kind of fusing-distilling-slagging-attuning to the local—explore the metaphysical language and speculative publishing of lived experience. A Published Event is an offering to participate. A cut that releases and absorbs. Leaks and floods. In relations of body, duration and event. Propelled by a desire to connect with the more-than-human elements of everyday life, we seek a kind of solidarity built on affective attunement. Through our libraries of stone and wood we move speculatively but with conviction, implicated in every act of making-public, always with each other. Since 2015 we have undertaken three large-scale publishing projects. In Fall of the Derwent (2016), we invite the river to write us as hydrographic score. In Lost Rocks (2017-21), a literary-lithic exploration of absence re-composed, we invent the fictiōnella as a gesture of experiential telling. In The People’s Library (2017-18), part performance library-part contemporary artwork, we offer an island the opportunity to publish its new and original works in any genre. In each of these works, we make books. We also make publics. Each of these things generates their own unique forces. Both books and publics are lively things—they are leakings, holdings, they are (w)holes. They are events that can feel and make themselves felt. They are openings. In 2012 A Published Event travelled to Iceland, an island with many similarities to Tasmania. Iceland (unlike Tasmania with its 500,000 people and a functional literacy rate of only 51%), boasts a staggering literary output for a population of just 350,000. One in every ten Icelanders publishes a book in their lifetime. In 2007, the American artist Roni Horn published Vatnasafn/ Library of Water— three related collections of water, words and weather reports. The work, housed in a former library in the Icelandic coastal town of Stykkishólmur, includes 24 glass columns containing melt-water from glaciers in Iceland. Libraries are more than collections of words on paper. In Horn’s library, they are constellations of water, weather, ice and ocean. The library is not simply a collection of objects but a leaking, fizzing field of attraction. An energetic field of emergent connectivity. Subscribers can read the full version of this essay, including audio extracts of their publications.